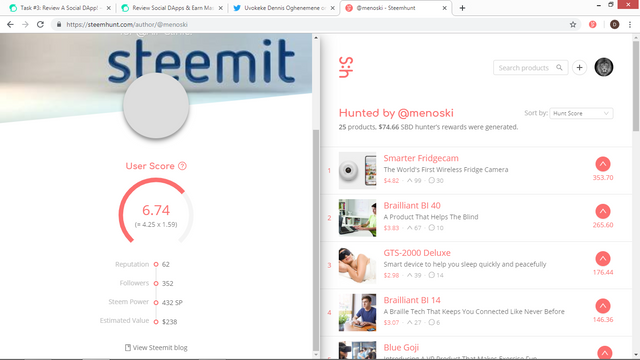 If you haven't heard about Steemit and Steemhunt, I guess today is your lucky day, because I'm going to give my honest review on Steemhunt and it's going to be mind-blowing. Steemhunt is a DApp [Decentralized Application] on the Steem blockchain. It is currently ranked number 5 on the Social category on State of the DApps ranking. This review is going to be very interesting and a bit length(just letting you know now, winks), so I would kindly advice that you find somewhere quiet and sit back and read through this super interesting Social DApp review, that I made just for you(smiles & winks). Steemhunt is a Social DApp on the Steem blockchain. It is similar to Product Hunt and Slant. It is about discovering new products and earning rewards from it. What I like about this DApp is that, you can actually earn rewards without hunting(i.e discovering) new products on the platform. By just being active on the platform, you would be able to earn a lot of rewards. By being active, I meant, dropping meaning & useful comments and upvoting(i.e liking) products on the platforms. For those that ain't on the Steem blockchain or the cryptocurrency world, some terms I would be using later on this review might be confusing for you, so I would explain them now, so you can fully understand this review. Hunters: These are the individuals on the platform that discover the products. I have been a hunter for over 5 months, but I only became a very active hunter, about 2 months ago(O boy, how I have regretted not been active all those while, smiles). Upvote: This is like, "Like" on Facebook, "Clap" on Medium, "Love" on Twitter, although it is a bit different on Steem blockchain. When you upvote a hunt, meaning you liked it, right? You would also give the hunter some reward. Like for instance, my 100% upvote as at now is $0.01(very low compared to others whose 100% upvote is $7). Let's now imagine if me and a hunter who has a $5 worth of 100% upvote, both upvote a hunt, we would be giving that hunt a total reward of $5.01. And also when you upvote on this platform, you would be able to filter quality hunts from low quality hunts with the influence of your User Score(don't worry, I would explain it as we go on). Hunt Tokens: This is the token of the platform. It was announced earlier this week that the Hunt Tokens would be worth $0.02 when they launch the Hunt Token via an Initial Exchange Offering (IEO) which is scheduled to run from 11th March to 29th March 2019 and after the IEO, the Hunt Token would be listed on Daybit Exchange. I must say, the Hunt Tokens has real high potential. User Score: Your user score is your influence on the platform, which helps to filter high quality hunts from low quality hunts. It is calculated with two variables to help stop the abuse of some users who tried to out smart the platform. These two variables are your Hunt Power Score(HPS), which is your Hunt Tokens stake multiplied by your Contribution Score(CS), which is based on your activities on the platform. Someone with high Hunt Tokens stake and that contributes to the platform positively and regularly would definitely have a high User Score. Mine is a bit high(smiles), check it out. Creating Hunts: When you create hunts you can earn either Steem, SBD & Steem or Hunt Tokens, depending on your choice. I would do my best to break the procedure down, so that you guys can know how to create your own hunts. The main task about creating your own hunt is finding the product. 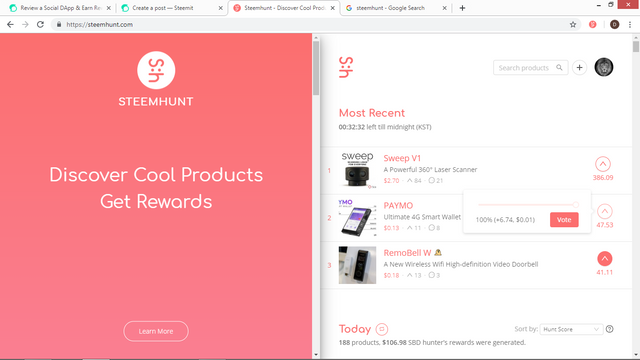 Steemhunt is almost a year old now, and hunters have been hunting products right from the start, so finding a new product now is a bit difficult because Steemhunt prohibits hunts that have already been hunted by another hunter. I can't really help you with how you can find new products that have technological features and that have never been hunted before. After doing that, the rest is very easy and straight forward. 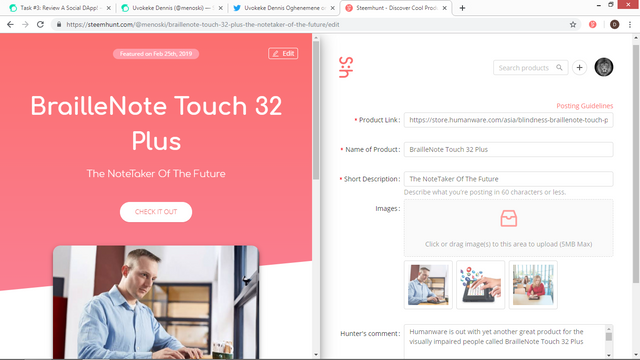 After finding your product, get the product's official site link and then copy & paste to the section where you would be asked to place it(there are screenshots of how I did my latest hunt, so you can scroll down and up to understand me a bit better). After that, write the name of the product, then a short description, describing the product. Add at least 2 pictures of the product. Then make your honest review about the product, make sure you don't plagiarize because the platform prohibits such acts. 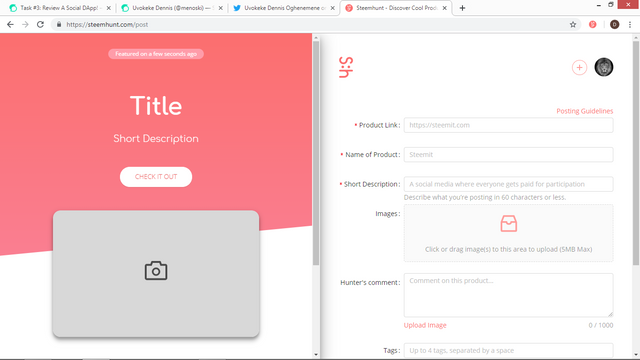 Then you can add tags that are relevant to the product. After that, click on "Post Now" and that's all, you would have successfully created your very first hunt(smiles). Some of you might not really have understood my explanation and maybe confuse on how to go about it, don't worry, I still got you covered(winks). About 6 months ago, a good hunter who goes by the name @Just2random created a YouTube video for this,I suggest you check it out to fully understand my explanation even better. Steemhunt has reduced their amount of Token Distribution greatly, and it's understandable, as they want the value of their token to be high, I also want it to be high(smiles). I feel awful not getting to at least 30k Hunt Tokens before the announcement, whereas most of my friends on this platform have over 100k Hunt Tokens. I wasn't serious about Steemhunt last year, and I'm still regretting it still now, but I can still remember what a friend of mine on this platform told me, "it's never too late to start", same thing I say to you "it's never too late to start", so start now. I would give you guys some tips on how to get more Hunt Tokens on this platform. Voting Hunts & Comments: Although, the rewards has reduced but it's still something. Ensure you vote at least 10 quality hunts daily to get a daily reward in Hunt Tokens. Don't vote any hunt you see, as that can affect your User Score, vote only quality hunts. Also try to vote comments in the hunts you voted. Boost Hunts: You would be asked if you want to Boost Hunt by converting your 100% reward from Steem, SBD & Steem Power to Hunt Tokens. The value of 1 STU is currently worth 19.84 hunts. I would personally advice you not to use this option. 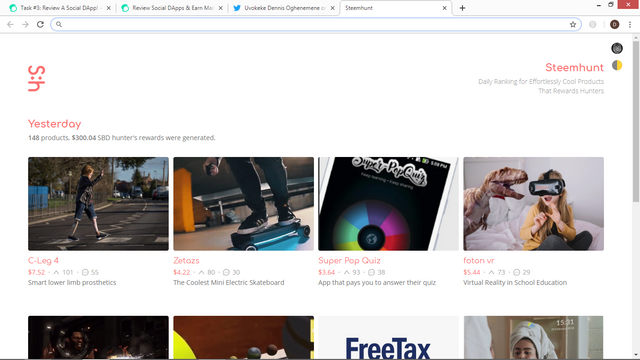 Install Chrome Extension On Your PC/Laptop: I enjoyed this Chrome extension airdrop back then. I earned 100 Hunt Tokens just for opening my chrome browser on my laptop, everyday. Although, now the reward is very small, but it's something. I earn 2 - 3 Hunt Tokens daily now. Just download the chrome extension and open it everyday to enjoy this airdrop. You can download it here. Shuffle Button Lottery: I also enjoyed this airdrop back then. I earned at least 200 Hunt Tokens daily from this shuffle button lottery, but now I earn about 5 - 10 Hunt Tokens daily, it's still something. Everyone has the opportunity to click the shuffle button lottery 4 times daily, with an interval of 6 hours. For every shuffle, you stand a chance to get 1 - 10 Hunt Tokens. Social Share Airdrops: I got to know of this airdrop a bit too late. I remembered getting over 1k Hunt Tokens on my first social share airdrop. Social share airdrops is basically about sharing hunts, be it your own or a hunt from a hunter on the platform to your social media, such as, Facebook, Twitter, WhatsApp, Telegram, etc. You would rewarded based on how many people that clicked on your shared link. A total of 90k Hunt Tokens are distributed on a daily basis to hunters that participated in the social share program(I don't know if it's still 90k). Twitter Campaign Bounty: This is the final way, I have been using to earn Hunt Tokens. Steemhunt wants to be super active on Twitter, so they came up with this very useful bounty. 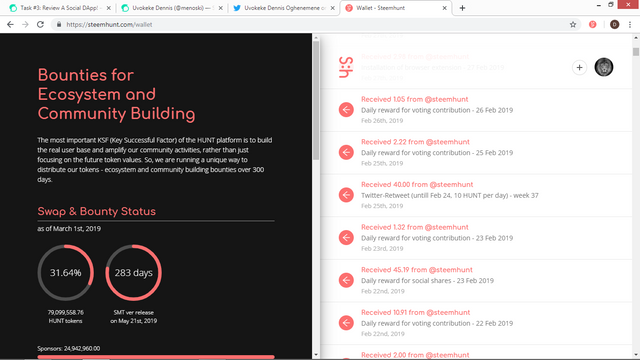 For following Steemhunt Twitter account, you would earn 100 Hunt Tokens. All you have to do is to follow Steemhunt official Twitter Account and then fill this form. 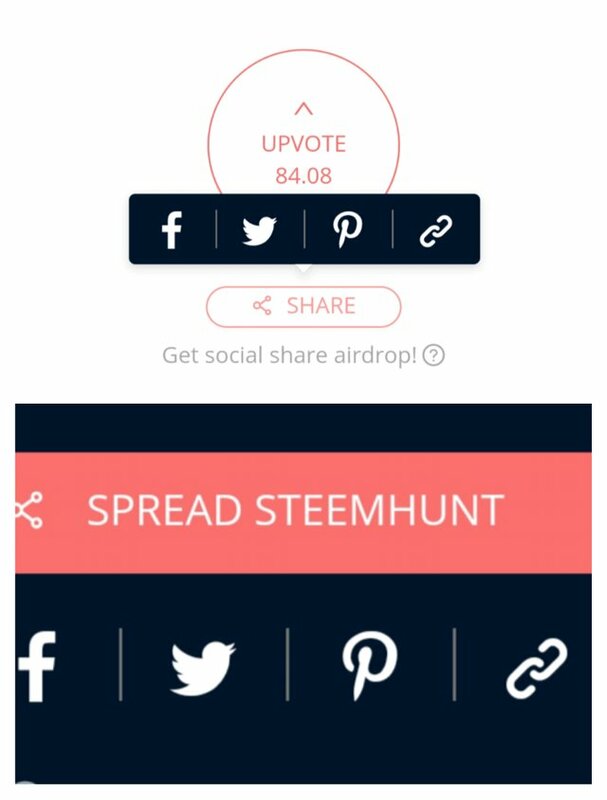 You can also be getting 10 Hunt Tokens daily for liking and retweeting a Steemhunt's tweet on Twitter everyday. Once you have liked and retweeted a Steemhunt's tweet, you should then fill this form. Although you won't get the 10 Hunt Token reward daily, it would be sent to your account on a weekly basis. Imagine, you did this task 5 days in a week, that means, you would be sent 50 Hunt Tokens for that week. Let me show these rewards would look in your wallet, by showing you guys mine. Yeah, I know a lot of you want to get started already(smiles). The procedure is quite simple, you have to get a Steem account. You can sign up through Steemit or Steem.ninja but I would recommend you sign up via Steemhunt Steem account creation interface as they would delegate 15 SP to you for a month which is very nice from them, I must say. 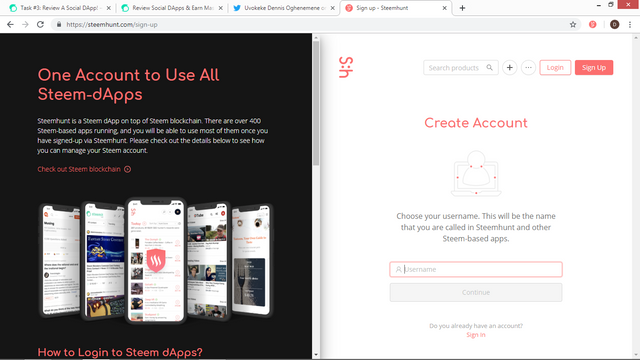 When you get a Steem account, visit Steemhunt site and then login via Steemconnect(using only your Active Key and not your Private Key) to Steemhunt and your awesome journey begins. Steemhunt is the DApp that I'm currently most active in. 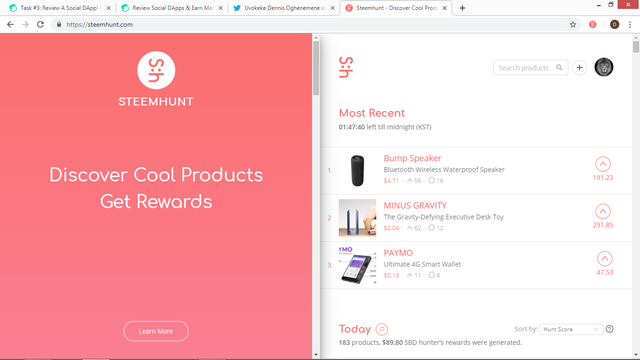 I'm visit Steemhunt at least 12 times everyday because I enjoy seeing new awesome products from hunters and at the same time I vote and comment on quality hunts and earn rewards, the platform is just fantastic. The platform has one of the best user interface among other Social DApp. It's future is mind-blowing, I honestly feel that Steemhunt is going to be among the top 3 Social DApps very soon and maybe even the top of them all. If I should ask other hunters about, the future of Steemhunt, I know for sure that they would also be confident that the future of Steemhunt is very promising. Let's move to Cons. It takes quite some time to know if your hunt is verified for Steemhunt upvote, sometimes you may wait over 16 hours, that's very frustrating. I know the Moderators have their real-life but it's still not cool waiting that long. But honestly off late, there has been some huge improvement in the section and I'm really glad and I hope it stays that way. Steemhunt is a decentralized application in almost all areas within the platform, but in a very vital aspect of the platform, they are not completely decentralized yet. Your wallet is not under your full control yet, you can't send nor receive Hunt Tokens and also the Dev team has some control over your wallet for now, which is very uncomfortable. Although, we hunters know that the ERC-20 token withdrawal feature is still under development and will be launched soon, but the idea that all my Hunt Tokens are vulnerable for now, is still quite uncomfortable for me. Steemhunt and Hunt Tokens have a promising future and I won't be shocked if someday Steemhunt becomes the most successful Social DApp on the entire blockchain. I rate Steemhunt a massive 4.8 out of 5. Disclaimer: The content of this article does not intend to serve as financial advice, kindly do your own personal research. Thank you for this nice blog post about Steemhunt. You did a really good job in highlighting the reasons why you believe this to be a great project, and I like all the information provided. Keep up the good work. On the content side, I am pleased with your good work. The post is extensive, detailed and editorial, and I appreciate the fact that you took the time to share information about your personal knowledge, concerns and experience of using the platform. We value your personal views, and I am pleased with the quality content that you provided us with. That said, I strongly believe that this post could have been better written. There were issues of style and proofreading. Nevertheless, this is a really nice contribution, and I enjoyed reading your work. I just think that this would have been a stellar post if you had checked your text thoroughly before publishing. I am looking forward to seeing more awesome content from you in the future. Thanks for the kind words and your review @lordneroo, I would definitely improve next time.